Albert Falzon's first film Morning of the Earth has become a surfing classic. Following this film he made Crystal Voyager about eccentric surfing/inventor George Greenough featuring the music of Pink Floyd. He was also co-founder of Tracks magazine and produced and directed festival films in India, Tibet, Africa, Sth America. He has also made films with Brian Eno and the classic 70's avant garde rock band Talking Heads. 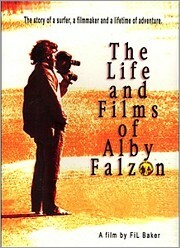 Fil Baker directed this documentary on the life and films of Falzon's travels and adventures during the making of his films.